Michael and I visited West Palm Beach last weekend for a quick getaway to celebrate his 30th birthday. It was such an easy trip from D.C., and it was sunny and warm all weekend long! Why West Palm you may ask? Well most of our domestic trips start with a quick look at Southwest’s service areas. Since we have the SW Companion Pass, one of us flies for free, so we basically split the cost of one ticket, which is so bomb, and it makes traveling a little bit easier because it narrows down our list of places to go (Southwest flies all over though!). Read my posts on how to get the Southwest Companion pass here and here! SW offers a direct flight from BWI to West Palm Beach that’s just under 2 1/2 hours. Less than 3 hours to the beach? Count me in! We took an Amtrak train from D.C. to BWI, which takes about 30 minutes and costs around $12. We stayed at a Marriott property, the Palm Beach Resort Marriott Singer Island. This property is interesting in that you can book directly with Marriott or another option is to book through Airbnb or VRBO as a few of the units at the resort are individually owned. If you’re playing the points game, you should book directly through Marriott. 🙂 The resort was perfect for our purposes. It’s directly on the beach, has two pools, and multiple bars for beach side cocktails. There’s also a Starbucks on site and a couple of restaurants (the food was pretty sub-par but, they served their purpose for a quick lunch while trying not to miss too much of the sun). I’d definitely recommend staying at this spot. The convenience of the resort definitely outweighs its somewhat pricey nightly rate. In all honesty, we really just laid on the beach all day both days that we were there! I wanted to check out the shops along Worth Avenue, but I just couldn’t bring myself to leave the ocean. On Friday night we went to The Alchemist for dinner, which I would say you could skip out on. The atmosphere was fun, but the food was meh. Saturday night we did a much better job! We grabbed a cocktail at The Breakers Seafood Bar, which was really cool. It’s really fancy, in my opinion, and not a place I’d want to hang out for too long, but it’s definitely worth a visit! Next we popped over to the Blind Monk for beers. It’s a cool spot with a great wine and beer menu and delicious pre-dinner snacks. For dinner we decided on Hullabaloo. I highly recommend this spot! I knew it was going to be a great experience when we were seated on the back patio IN an Airstream! The service was wonderful and the food was delicious! 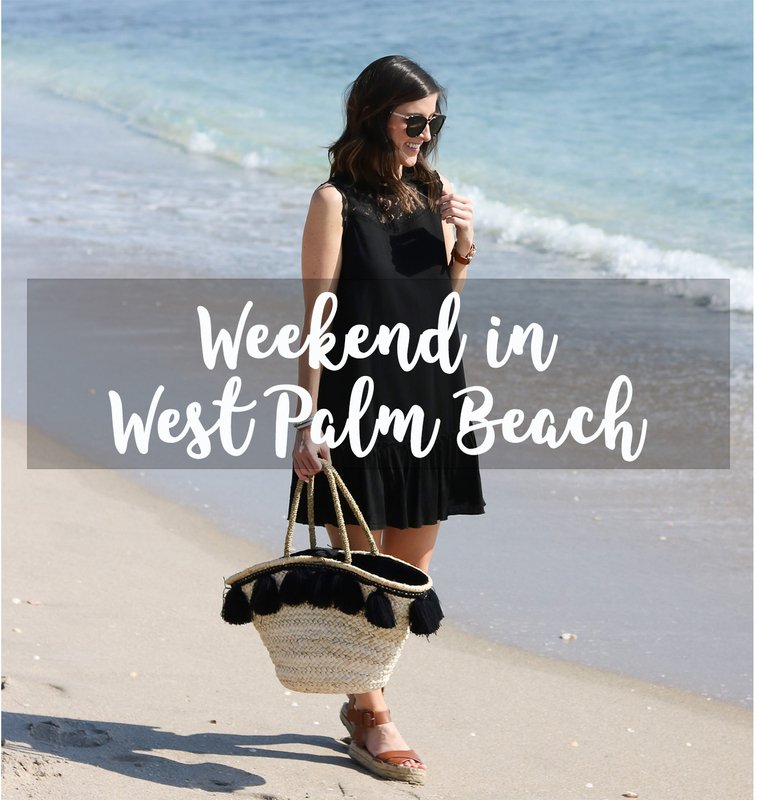 We had a great weekend, and if you’re looking for an easy getaway to a warm weathered beach, I highly recommend checking out West Palm Beach! Looking for more on Palm Beach? Check out Monica’s post! Thank you for sharing my post! So glad you had fun…any time you want to go back, just let me know 🙂 Where you stayed looked so beautiful! Of course! I want to check out y’alls hotel next time! Such a pretty place for a weekend trip! This looks like SUCH a fun trip! I can’t wait to hear all about it in person and thank you for straight shooting the restaurants! My sister and I are going in June and I couldn’t BE more excited! Yay! Y’all are going to have a blast! It’s such a pretty place!